Towards the end of the valley. I don't know why the leaf-peepers flock to Cades Cove to see "color." Sure, Cades is beautiful in its own right, but although it is smaller, Cataloochee Valley on the North Carolina side of the Great Smoky Mountains National Park is better for Autumn foliage, in my opinion. And you are guaranteed to see the resident wildlife: the elk. Provided, of course, that you go at the right time. 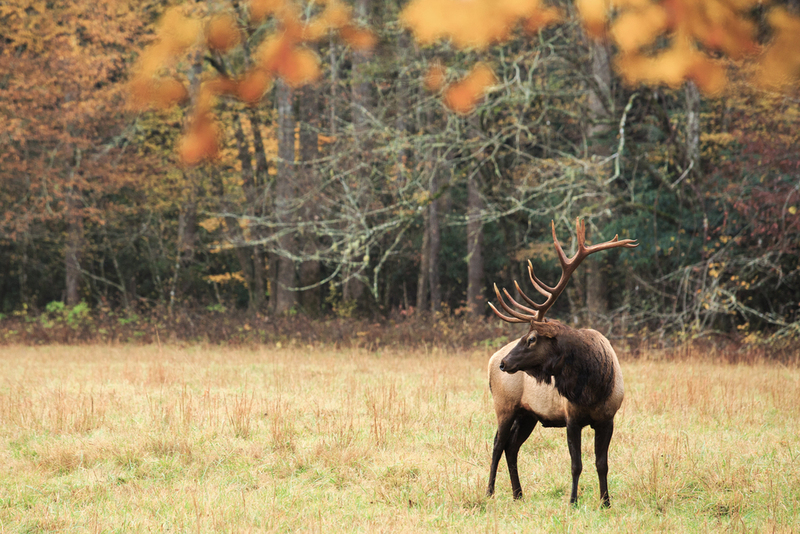 The elk like to spend their time during the day and at night in the woods. They come to graze in the valley right at dawn and right at dusk. How long they spend before heading back to the woods depends on factors such as the time of year, the temperature, the availability of food, etc. Since the only way into Cataloochee Valley is either via a long rutted, dirt road or a shorter, rutted dirt road, most tourists will come for the "sunset show" since they don't want to drive in the blackness of a pre-dawn morning along these roads. Fair enough - this leaves the sunrise for the photographers to come. Besides, in the morning you can get some nice mist. Yesssss . . .
Mmmmmm . . . ground fog . . . 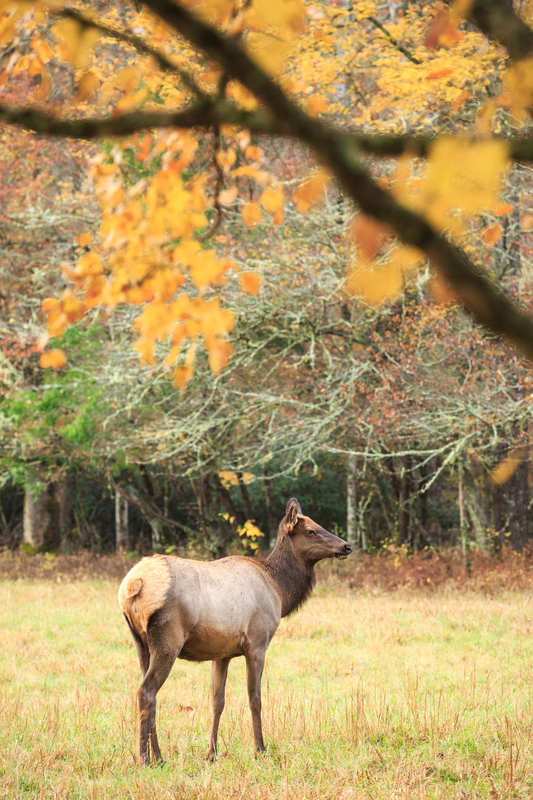 But really, it is all about the elk and right now Cataloochee has one big, dominant bull. There was another bull who got together a harem, but he had to be put down due to a wasting disease - that allowed this bull to combine his harem with the deceased bull's harem of cows and live a happy life. BTW, in the pictures that follow, I have cloned out the collar on the bull; he's wearing one so the park can monitor him to ensure no more disease. Unfortunately, it is a bright orange with a box, so I took it out; as a rule, however, all mature females are collared by the park so I left those in. "Hey baby, hey baby, hey baby . . ."
" And moree, much more than this . . . I did it myyyyyyy waaaayyyyyyy!" Okay, a confession - in the picture above, Big Guy is curling his lip, not bugling. I guess he had kicked a** earlier in the season, because none of the younger bulls were bugling to challenge him, but he did bugle about three times while I was there. Have you ever heard an elk bugle? It's pretty damn funny. "Amazing grace . . . how sweet the sound . . ."
Here he is bugling and I figured he was just singing a hymn by the old church. As I said, I think the color is better in Cataloochee Valley. Younger bulls play with mock battles, getting bigger and stronger, until they can challenge the dominant bull and acquire a harem of cows for themselves. Here is a gallery of remaining images. I hope you enjoy them and I would be grateful if you can pass on the link to this post, so others can enjoy the images but also because of what I am about to say. Okay, while most of the people out early in the morning are photographers, the overcast and cool of the day meant that the elk would remain in the valley longer - but this also means that by 8:30 am, more tourists were coming in. 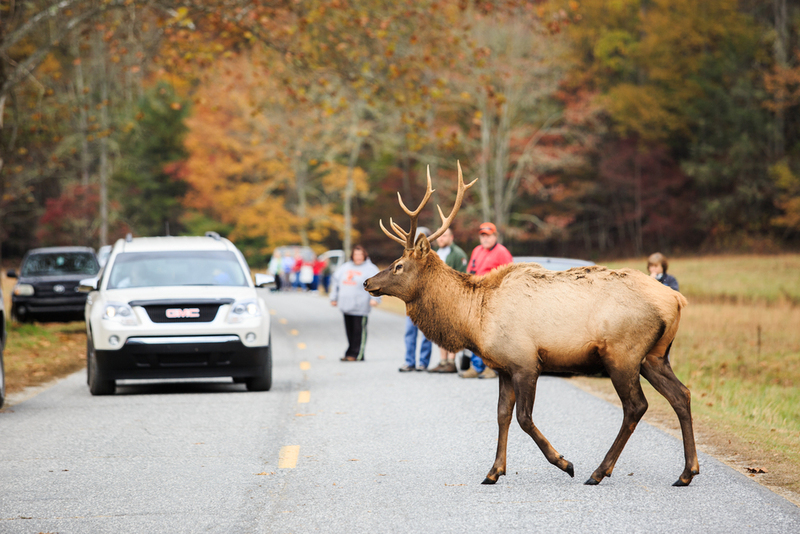 There are numerous signs informing people that (1) they need to stay away at least 50 yards from the animals (sometimes that is not possible, such as when they are crossing a road, but stay back a good distance and remain still while they pass) and (2) you cannot go into the fields during the rut in Cataloochee, i.e., the mating season. And the rut is on now. These two lovely tourons decided they would ignore those rules and walk out towards the old church (I am shooting this from the road where they are supposed to be) . . . placing themselves right between these two cows and the dominant bull. Now, he could see them as a threat - and charge them. If he had done that, it could mean they would be killed or seriously injured. The bull, however, despite doing what a bull elk in rut do, would pay with his life. The park staff would have to put him down. He didn't . . . BUT every incident like this, as seemingly innocent that it may look, contributes to the wildlife losing their natural fear and/or avoidance of man. They get used to man being there. Then they start seeing man as a food source. And that is when they become "nuisance" animals and are euthanized by the park. Cataloochee already lost one young bull when he "played" with a photographer; I heard from a knowledgeable source that this elk had been fed by tourists and that the photographer encouraged him by remaining there despite the opportunity to move. The result? The elk was put down, lest he do any more harm to visitors. So, please - don't be a touron. The rules are there to protect both you and the wildlife. I would like to think my grandchildren will be able to come and see the elk, the deer, the bears, the mountain lions, the coyotes . . . but behavior as demonstrated above little by little dims that chance. It is the public's park, but it's the animal's home. Remember that.